The ERZ-LNA-0270-0310-30-0.5 is a low noise amplifier (LNA) from Erzia is designed for applications operating within the 2.7 to 3.1 GHz frequency range. The LNA provides 29 dB of gain with a noise figure of 0.5 dB. Its modularity and compact size make it an optimal choice for a wide range of applications, including industrial, laboratory, satcom, telecom, space, aerospace, and military applications. The ERZ-LNA-0270-0310-30-0.5 features SMA female input/output RF connectors, solder filtered pins for DC connection, and several different mounting options. It is housed in a gold-platted, compact aluminum structure. High-reliability and dedicated screening/environmental tests are available by request. 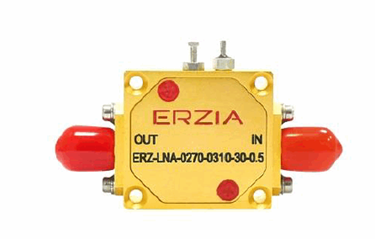 For more information on the ERZ-LNA-0270-0310-30-0.5 LNA, download the above datasheet.